Sawtell Toormina Saints have opened a two game lead at the top of the ladder after a resounding win over the Port Macquarie Magpies. Both teams struggled early in the strong breeze at Richardson Park resulting in a rare first quarter without a goal for either team. The Saints found their feet in the second quarter to lead the scoring with five goals, against which Port could only manage a solitary behind. The third quarter followed the same path, six goals for Sawtell against another behind to Port. 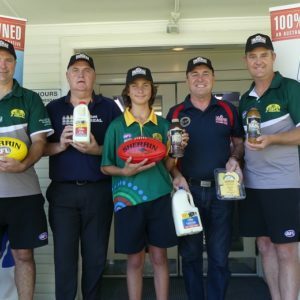 The Magpies kicked two goals in the final term but it was too little, too late with Sawtell adding a further seven goals to record one of their best ever wins over Port. Rookie Sawtell coach Brandt Lee has got his troops firing, with confidence building as the season’s unbeaten streak continues. The Saints are now two wins clear of both Port and Breakers atop the ladder but know they will face their sternest test to date against a full strength Breakers line-up in the next round. Port’s coach Russell Dawson will be scratching his head as he tries to work out how to replicate his team’s home form when the Magpies are on the road. Next week they make the long trip to Grafton and need to come up with answers quickly. 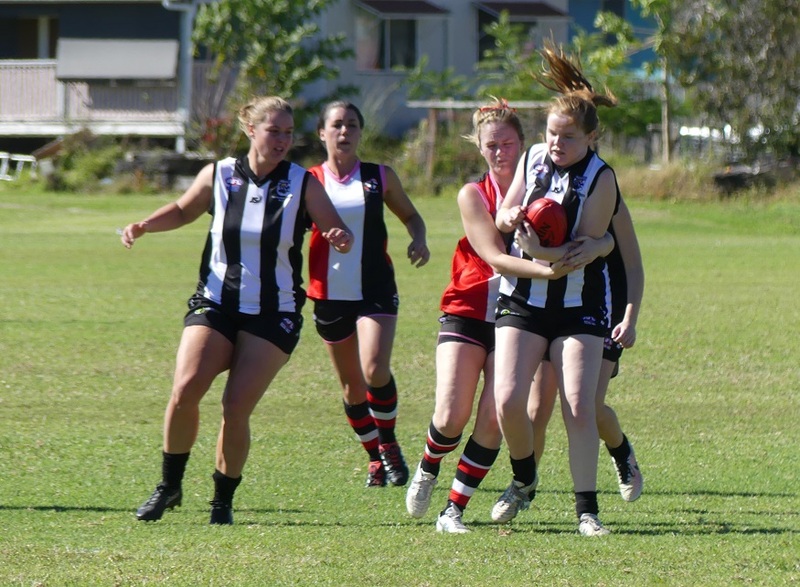 The earlier Women’s match between Sawtell and Port was much closer, but ended with a similar result. The Sawtell Women remain unbeaten and are two wins ahead of Port, who presented the biggest challenge to this point of the season. The Magpies will be disappointed by their opening quarter, allowing the fast starting Saints to jump out to a 25 point lead at the first break. Port fought back well from that point on and narrowly won the remaining three quarters by two points which will give them great heart for the remaining encounters between the two sides. 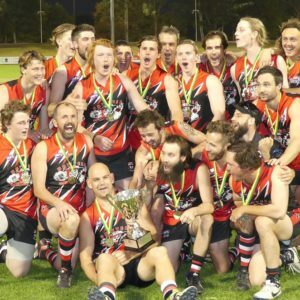 Sawtell continue their impressive start to the season and have definitely marked themselves as premiership favourites. Keira Basset is the find of the season, booting another four goals to mark herself as the form forward of the competition. Coffs Harbour Breakers returned to the winners circle for the first time since the opening round to maintain contact on the ladder with their local rivals. The clash with the Grafton Tigers presented as a danger match for the Breakers who were coming off consecutive losses and faced a Tigers who looked to have turned a corner last time out. Any thoughts of an upset were looking slim by quarter time as Breakers held a 25 point lead, and were completely dispelled by half time as this lead extended to 11 goals. Breakers saved their best til last to post nine goals in the final term and claim a 154 point win. In just his third game in the top grade Aden van Ryswyk led the scoring with five goals and was closely followed by Nick Stanlan Velt with four. Grafton cause wasn’t helped by a serious finger injury to Sam Hardes who will be sidelined for an extended period. One of the few upsides for the Tigers was the return of Pete Laurie who sustained a major knee injury last season and was a serious doubt to play in 2018.